Alone and unaided, The Shadow wages a solo war on crime in two thrilling pulp novels by Walter B. Gibson. First, the Knight of Darkness investigates a murder ring whose victims die twice, first in real life followed by a 'Death by Proxy.' Then, robbery, but The Shadow knows there is a hidden secret behind the 'Loot of Death.' 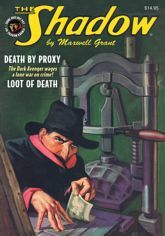 This double novel pulp reprint showcases original pulp covers, interior illustrations, and commentary.